A Progress 24 cargo ship launches towards the International Space Station atop A Russian Soyuz booster at 9:12 p.m. EST on Jan. 17. An unmannedcargo ship carrying fresh supplies and the likeness of a Russian spacelegend rocketed spaceward late Wednesday to restock the International SpaceStation. 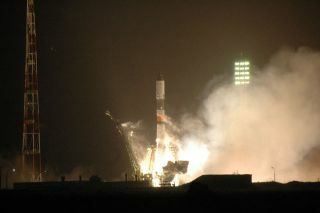 The Russian-builtProgress 24 cargo ship began the two-day trip to the ISS at 9:12 p.m. EST (0212Jan. 18 GMT) with a successful launch from the Baikonur Cosmodrome in Kazakhstan, NASA officials said in a statement. The supplyship is carrying more than 2.5 tons of cargo to the station's three-astronautExpedition 14 crew. Its flight follows the planned destruction of an older Russian spacecraft, Progress 22, that was jettisonedfrom the orbital laboratory on Tuesday [image]. Expedition14 commander MichaelLopez-Alegria and flight engineers MikhailTyurin and SunitaWilliams expect Progress 24 to dock at the space station's Russian-builtPirs docking compartment on Friday at 10:03 p.m. EST (0303 Jan. 20 GMT). NASAwill broadcast the supply ship's automated arrival live via NASA TV. NASAspokesperson Lynette Madison told SPACE.com before today's launch thatthe Progress 24 spacecraft included some new spacewalk supplies tucked amid the3,285 pounds (1,490 kilograms) of dry cargo packed in its hold [image].The cargo ship is also hauling 110 pounds of oxygen and 1,720 pounds (780kilograms) of propellant to the ISS, as well as new, Japanese experimenthardware to aid a study in protein crystallization, Russia's Interfax NewsAgency has reported. A portraitof SergeiKorolev -- who served as chief rocket designer for the former Soviet Unionand led the nation's efforts to launch the first artificial satellite (Sputnik) and thefirst human (YuriGagarin) into orbit, also rode into space during Progress 24's launch [image]. Engineers affixedthe image to the exterior of the spacecraft's Russian-built Soyuz rocket fairingto honor the 100thanniversary of the birth of Korolev, who died of a heart attack in 1966 atthe age of 59. Progress 24will join an earlier unmanned cargo ship -- Progress23 -- at the ISS. That older supply ship arrivedlast fall and remains docked at the aft end of the station's Zvezda servicemodule.